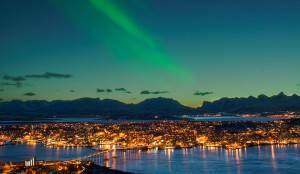 The Arctic town of Tromso is ideally located in the middle of the Northern Lights / Aurora Borealis zone in Arctic Norway. This vibrant town is located on the western coast of Arctic Norway. 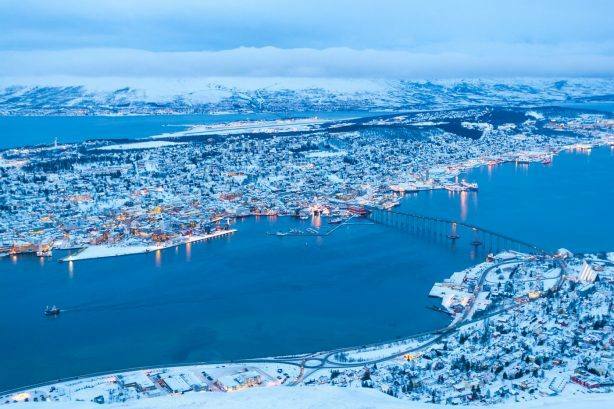 Tromso is Europe’s northernmost University town, and the second largest city and urban area north of the Arctic Circle. Old wooden houses in Tromso. Old, wooden houses: Tromso contains the highest number of old wooden houses in Northern Norway, the oldest house dating back to 1789. 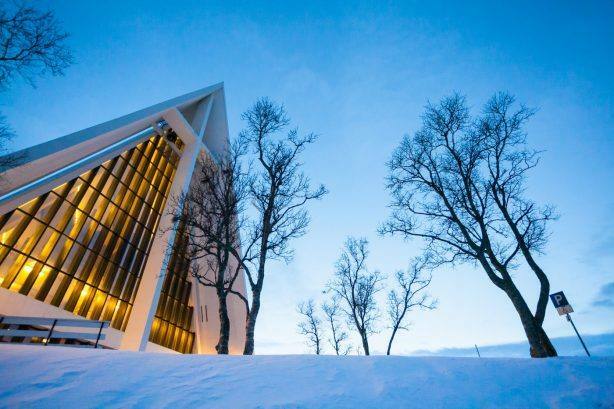 The Arctic Cathedral (Ishavskatedralen), a modern church from 1965, is the most famous landmark in Tromso. Polaria Museum is housed in a very distinctive building representing ice floes that have been pressed up on land by the rough seas of the Arctic. 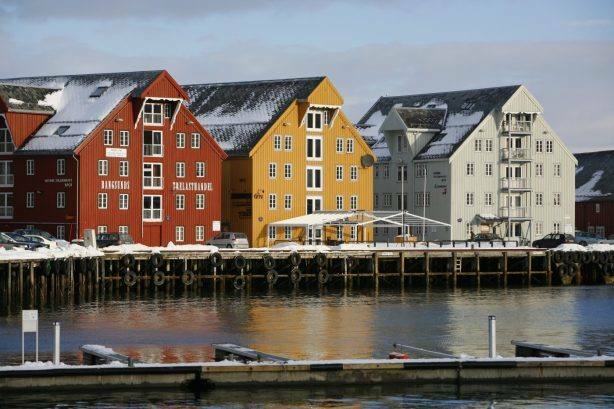 Tromso is surrounded by wonderful Arctic scenery, with islands and Alpine mountain peaks. Climate: The city is warmer than most other places located on the same latitude, due to the warming effect of the Gulf Stream. In January the mean temperature is only minus 3º Celcius. At the start of this milennium, Tromso suddenly realized that the Northern Lights really are something special to share with the rest of the world, and has since grown to be one of the most important Northern Lights destinations, with a large range of local operators offering their various Northern Lights excursions and snow based activities such as Dog sledding, Reindeer sledge & Snow mobile safaris. Between the end of November and mid January the sun does not appear above the horizon in Tromso. However, you will still experience some hours of light & twilight. The wonderful blue Arctic light is truly a unique experience! The amazing Arctic cathedral (nicknamed Ishavskatedralen in Norwegian), built in 1965, a famous landmark in Tromso because of the church’s distinct look and situation. Polaria Arctic Museum, an Arctic aquarium with bearded seals as the main attraction, interesting Arctic exhibits & you can watch wonderful films about the Northern Lights & the Arctic. 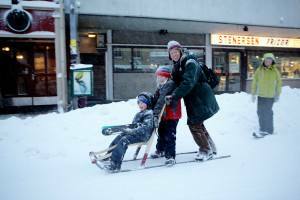 Storsteinen: At 421 metres (1381 feet) above sea level is the mountain and its cable car, which offers one of Norway’s most photographed panoramas — the view over Tromsø and the surrounding mountains. The Northern Lights Planetarium in the Science Centre of Northern Norway presents a scientific explanation of the Northern Lights.